I'm not going to act like some type of food goodie or deny the fact that I have indulged in doughnuts before ... That is not my point here. I know what a doughnut is and how it tastes. On the other hand, I feel justified in my disgust that my Facebook and Google were bombarded with donut pictures on June 7th for something called ... National Donut Day? Since when do we need to dedicate a national day to some refined starch, sugar riddened, empty calorie food? Is this really what we want to teach our children? Do we really need to bother our time and lives for such an unhealthy food? Not once have I seen a National Organic Foods Day or National Direct Sales Day graphic popping up on my Google+ or Facebook wall. In fact, it bugs me as much as when my baby sees a McDonald's commercial and brushes his hand across his chest (he does that instead of belly) while saying, "Mmmmm, McDonald's good" ... I hate it that McDonalds attracts from toddler to senior citizens when our nation is the MOST OBESE in the world. So, what makes them think that health conscious parents want to deal with encouragement of Dunkin Donuts and Krispy Kreme? What the ... YUCK??? I had to find out WHY! So, I looked into it a bit more and found out that Doughnut Day / Donut Day has been going on for decades. It is celebrated the first Friday in June to honor of the women from the original "Doughnut Day". 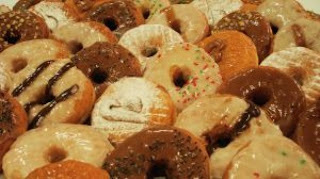 In 1938, The Salvation Army of Chicago started Doughnut Day as a fundraiser to help the needy during the Great Depression. The Salvation Army "Lassies" (later called "Doughnut Dollies") were the women who served doughnuts as their form of support to the soldiers during World War I. It is still observed to date as a day to honor those Lassies. Popular donut chains like Krispy Kreme, Dunkin Donuts, Lamar's Donuts, Tim Hortons, and local shops give away free donuts on National Donut Day. OK, so who am I to go against a patriotic tradition? I guess the doughnut is as American as apple pie. This is especially true for those who have loved ones that were in World War 1 and World War 2 (where the Red Cross carried on the Doughnut Dollie tradition). Plus, everyone get a free doughnut or two or three ... on National Donut Day. I read some additional information that stated there are 3 MORE DAYS for donuts!!! There's an International Jelly Filled Doughnut Day June 8th, National Cream Filled Doughnut Day (September 14th) and Buy A Doughnut Day (October 30th). Are you kidding me? 4 Doughnut Days??? Give me a break!!! “All For One” Low Carb Krispy Kreme Donuts. Can I get a WHAT THE ... YEAH!!! for finding this treat?